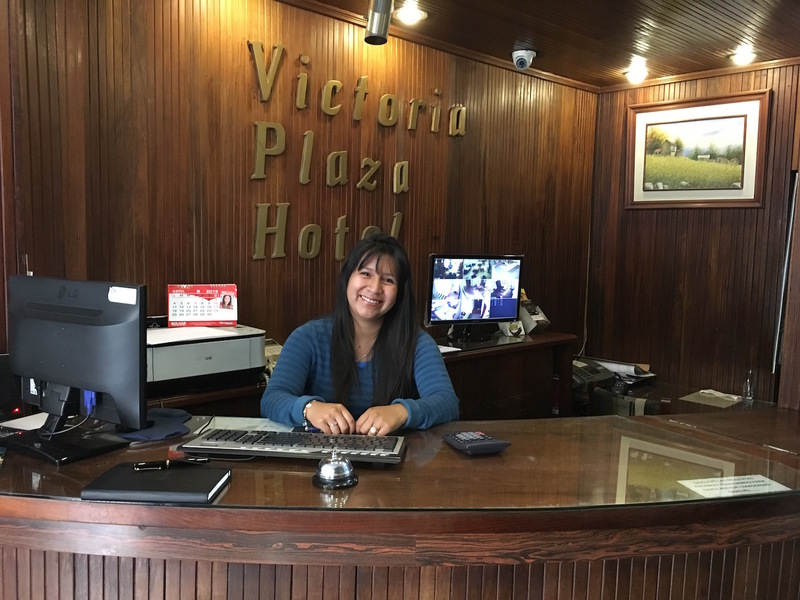 The morning desk clerk at the Victoria Plaza Hotel graciously posed for my capture. After traveling to Tarija and spending the evening with friends, both new and old, I slept well. I woke the next morning, but not too early, rose, cleaned up, and went downstairs to meet an old friend and colleague, David. We walked across the plaza to get breakfast before my morning meeting at Universidad Católica. The restaurante David chose served an American breakfast, desayuna Americana. It was actually a ham and cheese scramble, with coffee (instant) and juice. The food was plentiful and good and I was happy to have eggs for breakfast. It was also fun to visit with my old friend. He is very happy in Bolivia and has been encouraging me to come there for years. So, finally, I met him in his adopted home of Tarija, Bolivia. I can see why he loves the place so. We walked over to campus and waited for Enrique. The arrangement was for David and I to spend an hour or so with engineering students to answer questions. It was something I wanted to do while in Tarija. They were a bit timid at first, but warmed up with some encouragement. I think having the university president present may have dampened their enthusiasm a bit (administrators can be intimidating). Nonetheless, I enjoyed the interaction. In fact, being around students lit me up quite a lot, which surprised me. Of course, there were empanadas after the session. There was also time to mingle with the students a bit as well. Then Enrique drove me to his home where I met his family. They insisted I eat some lunch with them. So, I did although I was really not very hungry. He was a beautiful house and a lovely family as well. We were then off to retrieve the remainder of the U.S. contingent at the aeropuerto, then deliver all of us to the Victoria Plaza Hotel. We all had a chance to rest for a bit before meeting for supper. It was good to have my compatriots with us again. Supper was at Taberna Gattopardo, I believe. We ate at several places while in Tarija and I know at Gattopardo a couple of times, plus afternoon time streetside for tapas y cervezas.